Don’t give up on your garden yet. It is still possible to have a great harvest for the rest of the year. 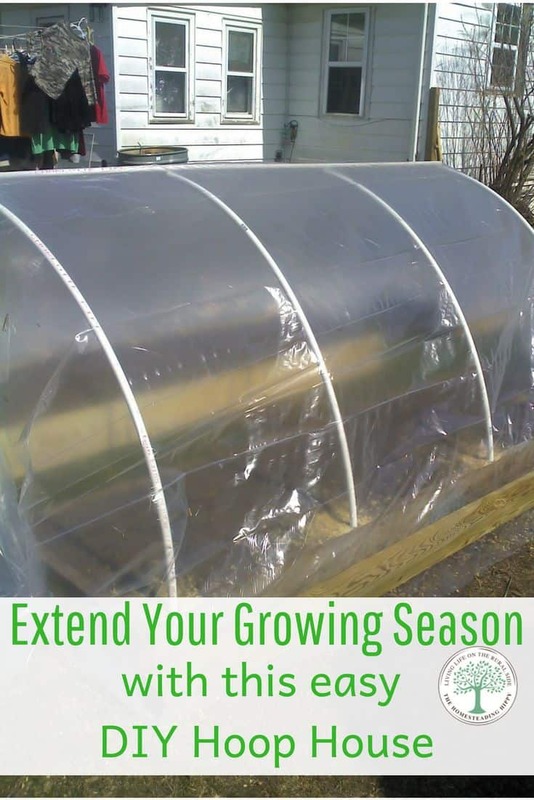 You can easily extend your gardening season and grow more veggies longer when you use a hoop house. When the heat is on outside, and you are spending your days sweating in your garden, it can be hard to think of frost, snow, and more. However, all good things come to an end, including summer’s heat and sun. However, that doesn’t have to mean the end of your garden and harvest for your family. It’s not hard to extend your growing season, either. These vegetables can handle temperatures to 15 degrees Fahrenheit, and some are even sweeter when they have experienced a light frost, such as brussels. You can also prolong your growing season of warm season vegetables by providing a cover for your garden. You can also use these in the early Spring to give you a jump start on your growing season for the Summer. 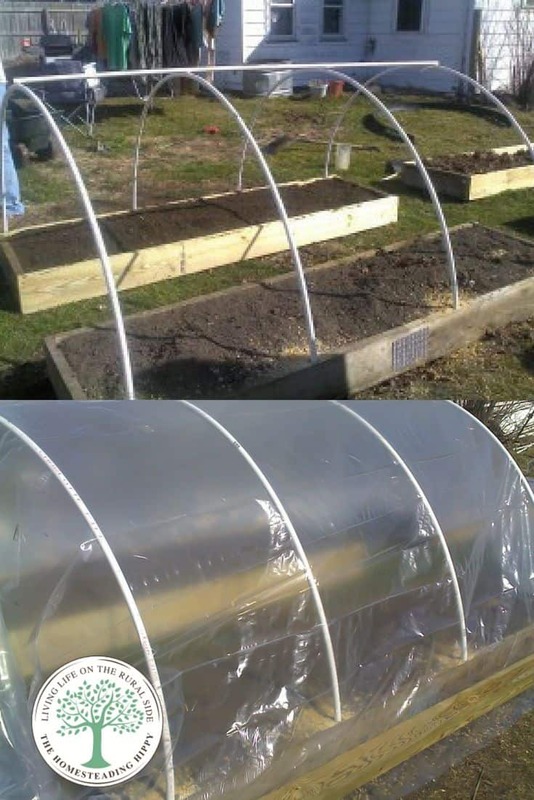 use plastic row covers to help provide easy access as well as protection. Start with 3 boards that are 2x8x12, making a rectangle out them. Drill 3 3/4″ holes on the far sides. Place 3/4 inch PVC pipe into the holes, bending into a semi-circle. Attach a length of PVC pipe across the hoops to provide support. You can either drill a hole and use a screw to hold it into place, or you can attach with zip ties. In the painting section of your local home supply store, look for 3mm plastic to cover the hoop frame with. This will be the most expensive part, and was $40. Be sure to tuck the edges in, and hold down with either dirt on 2 sides or use cloth and bricks to keep the plastic level with the ground. This will keep frost out. You can use this for Spring and early Fall planting. When the temps get high, you can roll the plastic back to allow the plants to get air, and even remove the hoops and store for the next season. What are you planting this fall? Be sure to pin this for later! I’d love to make little greenhouses like this! I hate feeling limited by the cold weather. My parents are the one with land so I’ve been hounding them to start their fall plants (I live 2 hours away). I found my way here through Green Thumb Thursday! Very cool! Our garden was an absolute disaster this year, but we’re planning on keeping it going into the fall. I’ll definitely have my husband check this out…he’s the green thumb of the family! Great idea! I have been wanting to start a fall garden! I may have hubby build one of these for me. What a cute and cost-effective little temporary greenhouse! I seriously wish that I could grow things. The sight of a garden in full swing is beautiful. This is great. 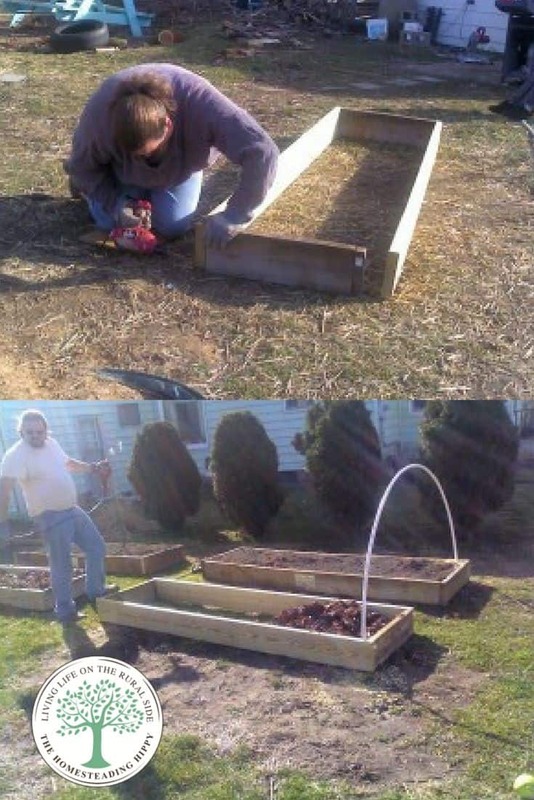 I already have the raised beds so all I need is the plastic and the pvc pipe. Thanks for the hint. Thanks for linking up! Your hoop house post is my special feature for this week’s Motivation Monday party. Hi! Stopping by from A Life in Balance Motivation Monday. This is a great tip – we already have the wood rimmed beds so this will be perfect for us. Thanks a bunch! That looks like a good simple design. I live in zone 7b and I often have fall veggies that are able to survive the winter and take off in the spring. With a hoop house I would have even more broccoli, kale, carrots, cabbage, etc make it through the winter. I will consider putting hoops up in late October. Thanks for sharing. So, I like the idea of the two rows covered by one set of hoops, but wondering how it worked out in practice? My husband thought it would be a pain to walk in between to collect veg. How did it turn out? Not sure if my last comment went through, so I’ll send again. I like the idea of 2 beds under one hoop, but how does it work in reality? My husband thought it would be a hassle to walk in between. We have one hoop already, which looks like the same height and I wouldn’t want to walk under it. How did it turn out? I’m hoping to build some this weekend! I do not have garden boxes like yours though and need to protect what I already have in the ground (lettuces, kale, potatos that I planted too late -oops- and possibly more if I can). I have a 5×35 foot row I’m hoping to cover. Have you seen this done without boxing it out? I’m having a little trouble finding good sources and am a newbie at this. Thanks for your great posts! How did you attach the top support? I can’t quite tell by looking at the picture. This might work for our existing raised beds (used 2x10x) that are 4 feet across. Very excited as I was just starting to think about how to extend our growing season – first frost is around 10/4. how did you keep the plastic down on the sides? We did this with our bell-peppers and had them for 3 years. It was wonderful! I just had to prune them in early spring. Thank you for sharing this week on the Art of Home-Making Mondays! Great idea, I need to spend some more time prepping in my garden that’s for sure! How far into the winter can you use this? How practical would it be in the North East region of the US, southern NJ? I use this in zone 5…and I have friends who do this in zone 3…so yes, it probably would help. Didn’t read through all the comments…got a late start on my tomatoes in straw bales…plants are beautiful, but just now getting flowers and I don’t see any pollinators…just trying to figure out the best way to cover them for cooler weather….